Happy Birthday Carrot Cake | I made that! I will admit that I haven’t spent much time on this post. Things are busy (are you as tired as I am of hearing me say that? ), but there’s always time for a birthday cake. (Happy Birthday Katie!) This is a cake recipe I’ve been dying to post, mostly for the selfish reason that I want it available to me online whenever a cake emergency arises. So here you are, with completely unspectacular photos, a spectacular carrot cake. This cake recipe comes from Molly, who I am realizing has quite good taste in cakes. 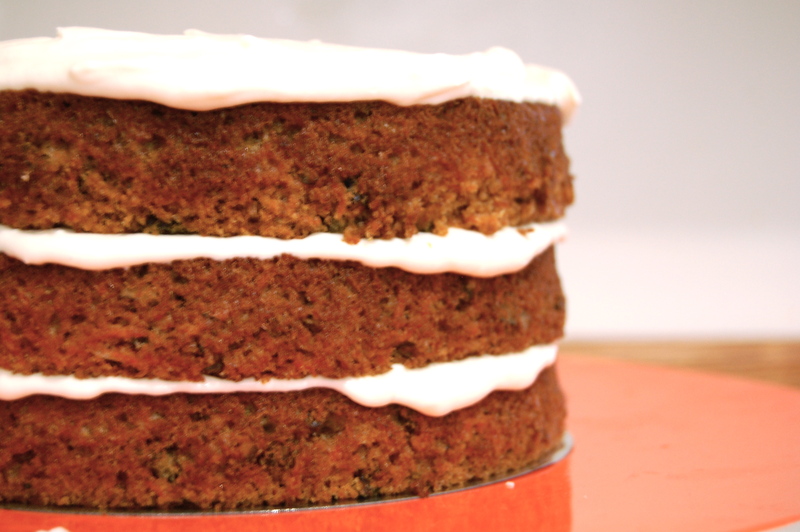 This one might possibly be the most perfect carrot cake. Moist, tender, not at all too sweet as they sometimes are. And a complete cinch to throw together. For the frosting I tweaked Molly’s recipe a bit, because I wanted something a bit more tart and sour. So being the obvious person that I am, I added sour cream. And lots more lemon juice. This particular cake I made for my friend Katie to take to a dinner, so I didn’t even get to eat a slice. That was hard, and I will probably have to make another one all for myself. – Position racks in the top and bottom third of the oven, and preheat to 325°F. Lightly grease 3 (8-inch) round pans with butter. Line the bottom of the pans with parchment paper. – In a medium bowl, combine the flour, baking powder, baking soda, salt, cinnamon, nutmeg, and ginger. Whisk well to blend. – In the bowl of a stand mixer, beat the sugar and oil until combined. Add the eggs one at a time, beating well to incorporate after each addition. Add the applesauce, beating to mix. Add the flour mixture, and beat to incorporate, scraping down the sides of the bowl with a rubber spatula if needed. Add the carrots and the pecans, and beat briefly. – Divide the batter evenly between the prepared pans. Slide the pans into the oven and bake until the cakes begin to pull away from the sides of the pan and a toothpick inserted into the center comes out clean, about 35-45 minutes. Cool the cakes in their pans on a wire rack for 15 minutes; then turn them out onto the rack to cool completely. – In the bowl of a stand mixer, beat the butter and cream cheese on medium speed until smooth. Sift in the powdered sugar, and beat on low speed until incorporated. Add the sour cream, vanilla, lemon juice and salt, and beat well to incorporate. If the frosting is lumpy from the sugar, bump the speed up to medium-high and beat the crap out of it. Oh my goodness!! Happy birthday to me, indeed!!! She does not lie, this birthday cake will go down in history as the nest carrot cake the has ever called me out of bed at two a.m. for another slice that was only supposed to be a little lick of frosting. Thank you thank Thank you!! My only regret is that it is gone and I am left to my carrots in their naked non- caked state. I was writing with a silly question. Is leaving a comment or replying to your tweets the only way to contact you? I tried sending you a message via twitter, but couldn’t since you do not follow me. Then I tired sending you an email at info (at) thepanttryatdelancey and the email bounced back. Can you help? Hi Brenda, Sorry you’re having so much trouble! I just sent you an email form my personal account. I have yet to meet a Molly recipe I did not like … I’m sure carrot cake will be no exception, thanks! Ha! I made this carrot cake, also for someone else. And am dying to make it again! 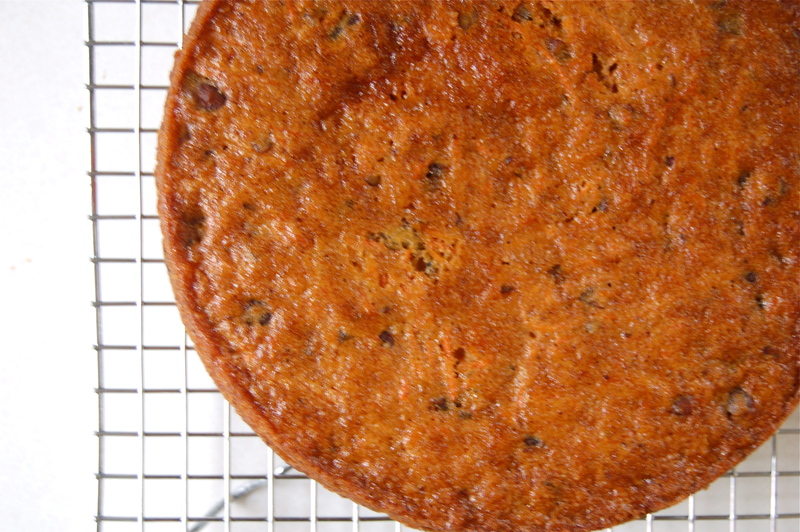 It really is a fantastic carrot cake recipe. I wanted to keep it all for myself! Yours looks gorgeous! I keep seeing this cake mentioned – time to get baking I think. It looks beautiful as a 3 layer cake. I have a complete addiction to carrot cake – and it must have cream cheese frosting as far as I’m concerned. This one looks wonderful. this look so lovely:) thank you for sharing this and have a great day! Wow – the frosting looks delicious. I love carrot cake so will definitely have to try out your recipe. Thanks for the inspiration. I used Molly’s carrot cake recipe (with the maple cream cheese frosting) for my friend’s wedding about a year and a half ago. I had soooo many compliments. It really is a fantastic cake. I really love the idea of a sour frosting. I’ll have to try that. I made this on a lark but brought it to a birthday where it there were already two other cakes (lemon and chocolate) and this was the winner. Thanks for sharing the recipe! I added dried cranberries but next time i think i will try without them.